If It's Hip, It's Here (Archives): The Fiat 500 by Gucci Promoted With These Four Short Films By Various Directors. 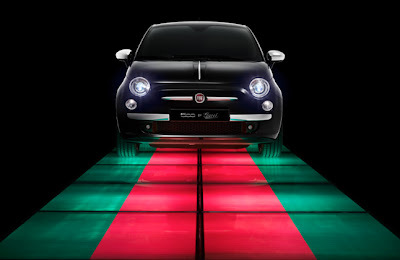 The Fiat 500 by Gucci Promoted With These Four Short Films By Various Directors. About a year ago, I gave my readers a good look at the Fiat 500 by Gucci (and the chic matching accessories). Now, Gucci's Creative Director, Frida Giannini, and Fiat invited Jefferson Hack (Editor in Chief of Dazed & Confused and AnOther Magazine), NOWNESS, Olivier Zahm (Editor in Chief of Purple Fashion magazine), Franca Sozzani (Editor in Chief of Vogue Italy), and Alexi Tan (Film Director) to produce a short film with FIAT's 500 by Gucci as the inspiration. The results are the following four short films of varying lengths starring the 500 by Gucci seen through the eyes of some of the most visionary creatives in the world today. Get a good look at the Fiat 500 by Gucci and some matching accessories.